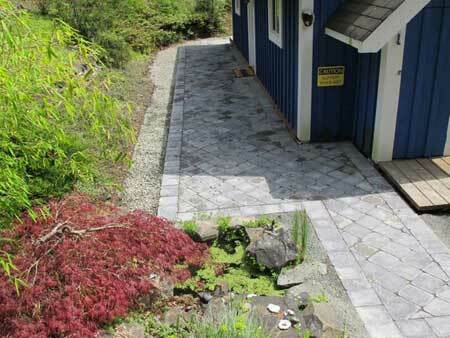 Poor drainage was the main reason for replacing a timber deck with a paved patio. Timber decks are often constructed with little thought about drainage. Water can become trapped and pool underneath, eventually affecting the property. The new patio needed to be lower than the former deck level to clear the door thresholds and also provide an adequate damp barrier. This created an aesthetic problem where removal of the deck revealed unsightly finishing which had to be made good. A new drain system was installed along the edge of the planted border to divert run-off water from the surrounding garden slopes away from the property. The job was finished off with a new planted border and a small decorative pond. Concrete pavers were used for the patio. To create interest, they are laid in a diamond pattern with a straight-edge border. Gravel is loose laid over drainage channel along the edge.